The broad political Left in the United States has been plagued for decades now with a culture of reaction, fragmentation, issue silo-ing, and a chasm between insiders and outsiders. 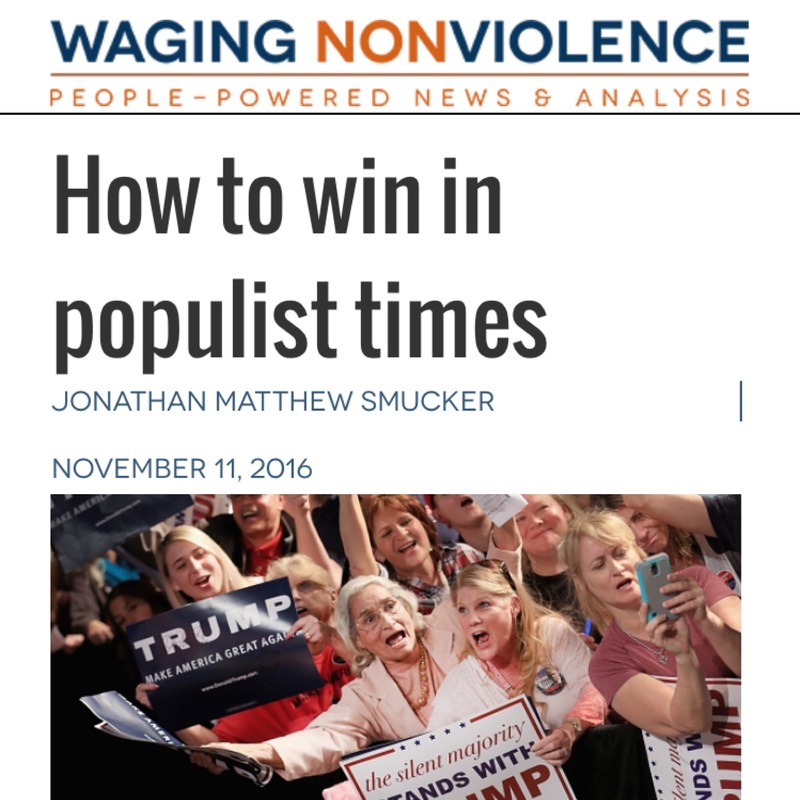 Can the concepts of populism and hegemony help to explain these challenges? What insights might we gain through a study of these ideas? Populism and hegemony can mean very different things to different people. Rather than frontload this series with my particular working definition, I’m going to try to build from the ground up. To approach these concepts, first we need a working definition of political identity; what it is, what purposes it serves, and how it operates. This is the topic I will focus on in this post. Identity is a group-oriented process. We often think of identity in individualistic terms; identity as the definition, self-conception or self-expression of the individual self. However, defining or expressing one’s self implies an other to which one defines or expresses oneself. Identity, therefore, implies relationship. It is a process that is constructed in relationship. Even identities that feature highly individualistic characteristics are still signaling something to someone other than oneself. And it’s not just a relationship-constructed process. It’s also a group-constructed process. What we’re signaling is largely about the group we identify with and our place in the group. One can signal many particular things with (and within) an identity, but the two foundational things we signal to each other with our identity expressions have everything to do with the group itself. These two things are belonging and distinction. For example, if everyone in my social network attends church, I too am inclined to attend church at least in part because it signals my belonging in my social network. (It may even be a required expression of belonging in some social networks.) And I may refrain from alcohol and drugs in order to distinguish myself from the other (e.g. sinners, non-believers, etc.). Now, I may be able to offer many good reasons why I have made an individual choice to attend my church and to take part in all of the rituals and life choices that go along with that. I’m not arguing that these conscious reasons are false or disingenuous. But they do not change the fact that I am also signaling belonging and distinction through these identity expressions. Now, let’s not pick on hippies just because they make for such easy targets. This is a universal logic that I believe applies, to some extent, to all human groups: dominant groups, subdominant groups, and marginal groups alike. The guy with the short crew cut is doing the same thing as the hippie: signaling likeness (belonging) to “the group” with which he identifies, as well as difference from other groups and identities. This signaling practice happens everywhere all the time. It happens through hairstyle, fashion, diet, lifestyle, musical tastes, dance moves, courting rituals, leisure interests, hobbies, career choices, political preferences, rhetoric, slang, even accents! We are constantly signaling belonging and distinction. It has everything to do with community. It has everything to do with power and politics. It has everything to do with us and them. And, I suspect, it has everything to do with primal and pre-conscious group-oriented survival instincts; with how we have evolved to behave in highly social and cooperative groups. We like to think of our life choices &#151 especially the big ones that constitute our identity &#151 as self-aware, rational choices. But let’s be real. The prefrontal cortex is, in the span of evolutionary time, a new kid on the block. Only a very small portion of our brain activity involves conscious rational thought, and that part is not divorced from primal and pre-conscious emotions and instincts. Our orientation toward “the group” certainly has conscious and rational aspects, but, like most of our behavior, it is predominantly primal and preconscious &#151 similar to how bees do not consciously decide to do this dance or that dance to indicate to other bees where to find the pollen. Rather, these dances, and the ability to instinctively read the meaning of the dances, are the behaviors that served the group best and therefore survived. In a social species, the behaviors that best serve the group tend to be the behaviors that survive (and therefore reproduce) over generations. I’m suggesting that a primary function of identity is for group members to signal belonging and commitment to the group, thereby contributing to the health and well-being of the group, while also securing one’s individual place (and therefore survival) in the group. Distinction (A) from other groups: I belong in this group because I am different from members of other groups &#151 especially groups that my group views as a threat or that the group identifies itself in opposition to. Distinction (B) from other members of the same group: My particular role and contribution in this group is _____. I am especially or uniquely needed in this group because of my particular contribution. But what about values? Don’t I construct my identity according to the values that I develop? This can certainly be the case, but those values are constructed by my identity and experiences with some group in the first place. And, as with identity, we may benefit by asking what purpose values serve? What is it about values that allowed them to develop into a phenomenon, to occupy a place in our cultural practices? According to the above “equation”, we develop our values based significantly on 1) our identity with particular groups, and 2) our beliefs and perceptions about what will best serve our groups. What we believe will best serve a given group is based on an ongoing cultural discourse within the group, where the group makes sense of experiences, events, encounters with outsiders, developments, and changes. I use the word discourse in the broadest sense: values are expressed and developed and altered through many forms of discourse, including stories, music, ritual, rhetoric, colloquialisms, actions, service, leadership, and really anything in the day-to-day life of a group. Through such a discourse &#151 through the meaning-making processes of the group &#151 over time, the group identifies and articulates which things pose opportunities and which pose threats. These notions become the values (and even the common sense) of the group. For example, on a base level, a village located in an area where flooding is common may come to value building houses and community structures up on stilts. The flood is a threat. The technology of stilts is an opportunity. It gets more complicated when we push the framework from strictly material concerns and into the social arena, but there’s also no fine line between the two. For example, most foraging cultures value egalitarianism, especially when it comes to food. Hoarding is seen as a threat within such groups, and the pattern has been to develop, over countless generations, mechanisms that encourage, celebrate, and ritualize the sharing of food, and also mechanisms that sanction and punish hoarders (sometimes severely). The term group can mean many different things. A group may be proximate, fully definable, and localized, such as one’s village, workplace, or place of worship. It seems logical that, if we do indeed have group-oriented instincts, these would have evolved in some such proximate, localized groups. But today, “group” can mean much more; for example, one’s gender, sexual orientation, “race”, ethnicity, nation, economic class, political ideology, hobby, or sports team. With the label generic given group I am accounting for this broad spectrum of “groups”, and I am implying that we tend to project group-oriented instincts onto the full gamut of social aggregations and constructions, to a greater or lesser degree that is proportional to our level of identity with the given group. I will return to this idea of group identity projection&#151and the difference between proximate groups (like a church or workplace) and abstract groups (e.g. nation, class, public)&#151in a future post. There are of course many insightful lenses through which we can examine values &#151 other than the group-constructing, group-benefiting framework I have put forward here. One important approach to values that I will flag now and discuss in a future post is that of authoritarian versus egalitarian values (or, as George Lakoff puts it in his family-as-foundational-metaphor approach, strict father morality and nurturant parent morality). How does this group identity framework relate to politics, political struggle, and social justice? Limiting ourselves to the information we have here, killing the fox is a goal, but not really a political goal. Groups’ goals are not political until their realization comes into conflict with other groups. To be clear, for purposes of this discussion, I am not talking about “interpersonal politics”. When I speak of politics, I’m not referring to struggles between individuals, but between aggregations of people (“groups”). So, when achievement of a goal depends upon negotiation or struggle with other groups (or with a political system that contains other groups), that goal becomes political. A demand for the realization of the goal is a political claim. When political claims find cultural expression within a given group, this amounts to the political dimension of group identity. A group becomes politicized when something it wants to be or do is “messed with” by someone else &#151and when the group’s distain for the “messing with” is articulated into something actionable. For example, a black Christian congregation in the South in the early 1960s may value equality and human dignity. They may have a goal of treating each other, and being treated, respectfully and as equals. White supremacists (and the political systems and cultural institutions that they dominate) interfere with the realization of the black church’s goal, which gives the goal a political tone. To become a political claim though, it has to be demanded. It has to find cultural expression within the given black church. The grievance has to be made actionable. Once this has happened &#151 through processes of articulation &#151 the church has effectively become politicized. Next PostWelcome to the new BeyondtheChoir.org!